"God, I know you made me and everything here, but why am I not treated like one of your special creatures? Why is life so hard? I tried my best, I gave them lots of puppies. But my body aches, my belly is empty, and I am cold." I knew my circle of life was ending. 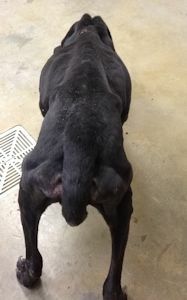 I guess the wonderful Richland County Dog Warden heard my plea, because he stopped as soon as he saw me. He was surprised when I quickly jumped in his truck!! Most dogs are afraid to go to a county animal shelter but I was thrilled. The shelter employees were so kind and gentle, something that my body ached for. They immediately gave me food, water and a blanket to rest my weary old body. Was I given another chance? 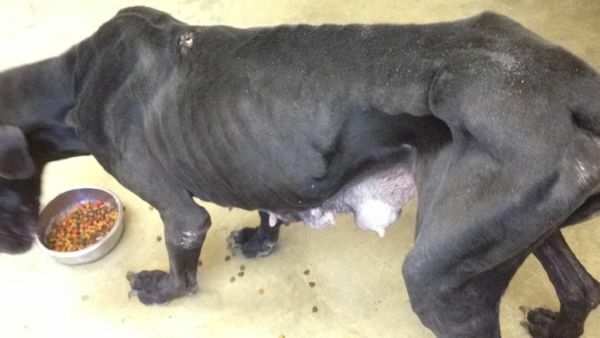 As you can see in my pictures below I am emaciated I weighted a mere 70 pounds, I have sores all over my body, I have mammary tumors and my nails have not been cut in ages. People used me for a "breeding dog" and I have had so many litters of puppies that I lost track years ago. My only hope is that my pups have found better homes than I did. I have had so many homes, and although in some of them I was cared for (but why did they give me up? ), I am trying to block out most of my earlier years because, just like my mom, I was bred over, and over, and over..... Ya see, my mom was a Hunte Corporation kennel dog where her life was spent caged and producing puppies to line people’s pockets. By the time I was a mere 8 weeks I had already traveled across the US, from the Hunt Corporation breeding kennels to a Petland Store in Mansfield, OH. When the family picked me from behind the glass window, I thought that my life would be different from my mom's. What I didn't realize was that my life of horror had just begun and it was to be no better than my moms!! I changed homes more times than I can remember and then neglected and abandoned! When my stray time at the shelter was up, another wonderful person was waiting. She took me for a very long ride. I slept most of the way, but I awoke to gentle rubs and kisses. The 3 hour trip brought me to Harlequin Haven. 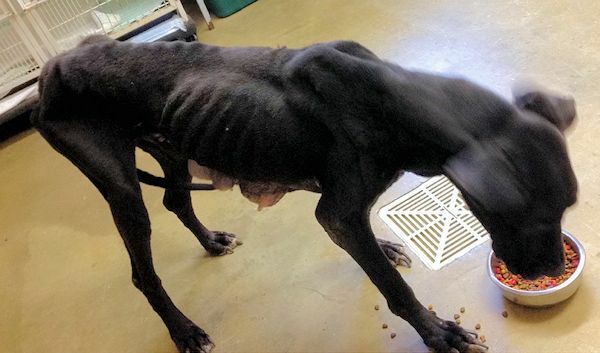 I was given my own room, I am receiving many small meals each day to slowly fill my emaciated body, I have a ton of toys, and a really really soft bed to rest my tired and weary bones and help my oozing sores heal. On Monday, I will go to the vet so he can determine the best course to move forward on with my desperately needed medical care. We do know that my blood work shows I am heartworm negative and Lyme disease negative, so that is a plus! I want to thank the wonderful people at the Richland County Animal Shelter, especially the Dog Warden that saved my life! 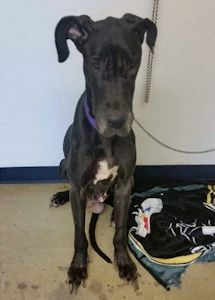 And I want to thank the wonderful young woman who drove so many hours to pick me up, showered my with kisses, gentle pats and so many soft words of encouragement while bringing me to Harlequin haven Great Dane Rescue. The wonderful Dog Warden is still searching for my owner so they can pay for what they did to me. 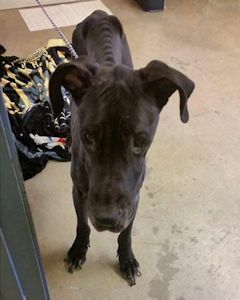 If you know who my owner was will you please contact the Richland County Animal Shelter at 419-774-5892. Update 2/29: I got up early this morning so I could go to the vets office and I just got back home. I now weigh 83.2 pounds although Grandma here at the rescue says she cannot see where I gained even a pound!! I had more blood work ran a chest ex-ray and a physical exam. When we get the results back from the blood work I will let you know if anything is wrong. My lungs are clear so Grandma said that was a really good thing!! The vet said that I will need 2 or 3 surgeries to get all of the mammary tumors and to be spayed and once that is all done I will need chemo to kill any cancer left in my body from the tumors. 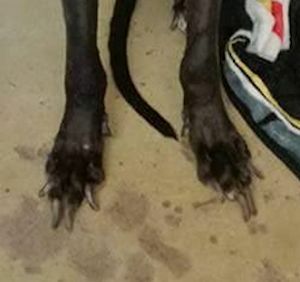 The vet said it will probably cost $4000.00 when all is said and done! He also said that I cannot have any surgery until I gain a lot of weight. Grandma told me not to worry that things will work out she also told me my job was to just eat, rest and enjoy life!! I think I can do that!! Well I gotta go have lunch and take a nap!! Update 3/3: It has been 9 days since the Dog Warden found me and got me to safety. I have gone from 70 pounds to 92.8 pounds!! I've gone from scared, hungry, cold and homeless to happy, loved, warm and, most of all, safe, with a full belly!! Well I'm gonna go snuggle on the couch while I play with my new toys and think about the future I never thought I'd see! Update 3/6: Great News!! I now weigh 101.8 pounds, I know you can do the math but I have gained 31.8 pounds!!! Life is fabulous, I eat, drink, get hugs and kisses and snuggle on the couch!!! Is it not amazing what being fed does for a dog!!! Hey check out my new picture below!! Update 3/13: More good news and some bad news!! I now weigh 115 pounds and my surgery has been scheduled. The bad news is I have went into heat! I have to wait till I am out of heat to have my surgeries!! Check out my new picture below!! Is it NOT amazing what a little food will do for a girl? Am I not the most beautiful girl you have ever seen? Am I not a regal looking lady? Update 4/3: I am finally out of heat and I have gained all my weight, I weigh 125.4 pounds!! I have gained 55 pounds in less than 6 weeks!! My first surgery is scheduled for Tuesday!!! I can't wait!!! Check out my new picture below!! Update 4/6: I had my first surgery yesterday and I had to spend the night at the vets office, but I wanted to be the one to give you my update!! 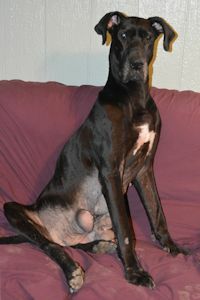 I was spayed and had 1/2 of 1 mammary chain removed. 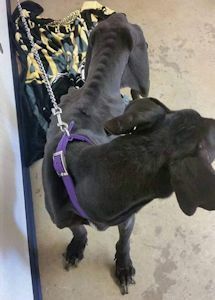 The vet had hoped he would be able to remove the 1 complete chain but since the largest tumors were in this area and the surgery was taking longer than expected he decided to stop and do an extra surgery so as not to put me through so much at once. So now instead of 1 more surgery I am scheduled for 2. BUT I did surprise him and Grandma because I ate some of my breakfast and as soon as I heard my Grandma in the building I stood up and started wagging my tail!! I was so happy to see her!!! Now for the reality of not being spayed and having so many puppies!! Only 2 tumors were removed yesterday but combined they weighed 2 pounds!! The larger of the 2 weighed 1.2 pounds!! 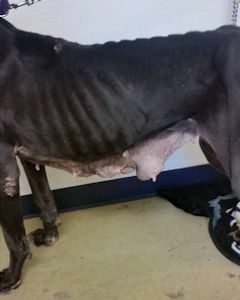 Granted there is a lot involved in getting mammary cancer besides not being spayed BUT it is a big part of it so if you love your dog then get her spayed and if it is a boy get him neutered!! Please don't tell me that you want to have just 1 litter or you want your children to see the miracle of birth or you don't believe in spaying or neutering!! The truth is not spaying or neutering is because you are too cheap or you are wanting to line your pockets with money from the puppies!! Ya see I don't want to hear it!!!!!!!!!! There are already enough homeless dogs in the world and yes that includes homeless Danes!!! If you love your dog you will spay/neuter them and not put them through the hell of chemo and the major surgery's I am having to endure!! Update 4/17: I just wanted to give you a quick update! I am doing great and can't wait for my 2nd surgery, which is scheduled for Tuesday. MY biopsy results came back as Adenocarcinoma and it is a malignant cancer. Well I gotta go and get a quick nap before dinner!! Oops forgot to tell you to check out my new picture below!!! Ain't I just the cutest!! Final Update April 27, 2016: It is with deep sadness that we share news of Marci's passing this afternoon. We were very hopeful after she had rebounded so well from her surgeries. But last night Marci took a turn for the worse and started having Grand-Mal seizures. Apparently the cancer had reached her brain and she didn't wake up from her last seizure. 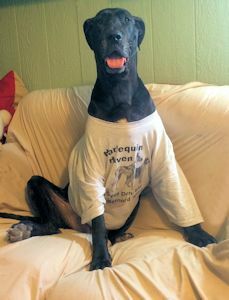 Marci was a loving and happy dog and she embraced the love she found at Harlequin Haven. 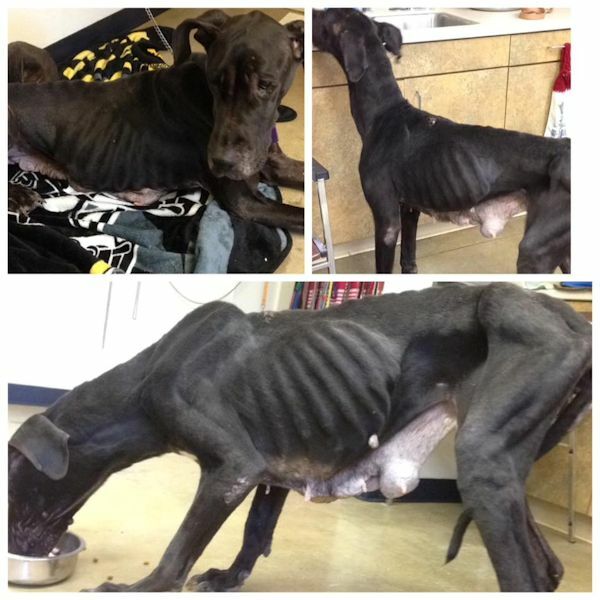 She deserved so much more than the treatment she received from her previous owners. We made a promise to Marci when she arrived and are comforted knowing that in the last 2 months of her life, she knew how much she was loved.